Several months ago I was asked by CreateSpace to develop an article on book marketing for a new resource center they were introducing. It’s called Marketing Central, and it’s a great site for self-publishers. In Marketing Central, (a top-level menu choice from the Free Publishing Resources tab), CreateSpace has gathered together a huge amount of information on marketing. You’ll find articles by experts like Brian Jud and Maria Murnane as well as CreateSpace’s own writers. I think this is a great idea because it creates a structure within which you can find articles, tips and resources that will help with your own book marketing. The article I wrote serves as introduction to the Marketing Central portal. As such, it’s kind of a high-level view of the process. While the article doesn’t present a lot of nuts-and-bolts details, it provides a perspective that allows newcomers to get a grasp on the marketing process and see where each piece fits into the whole. I’ve divided this long article into three parts, and I’ll post them here over the course of this week. This first article focuses on the most important part of book marketing: the book itself. What lies behind the fantastic success of some of the most high-profile independent authors? You know, the people like J.A. Konrath and Amanda Hocking, who we read about on the blogs and news sites? The answer is marketing. That is, communicating the message about their books to a wide audience, in many channels, and over a period of time. Sure, these authors have a lot of other things going for them, but you can’t discount all the time and effort they put into spreading the word, growing their brands, and converting readers into raving fans. If that’s what you want to do, too, it’s time to get up to speed on the basics of book marketing. You have the idea for the book. You find ways to test the idea, preferably with people who might actually buy it. You use the feedback you receive to shape the book to readers? desires, and then produce the book which they have essentially requested. Most indie authors, because they are motivated by passion, take option #1. You can market either kind of book, but your results may be very different. With option #1, you’re counting on determination (and a little luck) to make your book interesting to people, marketable, and profitable. 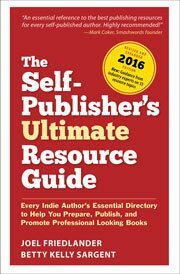 If you’re publishing and selling a book you already know your readers want, you’ve taken option #2. Whichever path you’ve chosen, book marketing is essential to helping you reach your goals. Let’s take a closer look at the basics. Book marketing is a big topic, so to make it more approachable, let’s break it down into areas we can look at individually. Taken all together, you should have a complete look at what’s involved in successfully marketing your book and allowing it to reach its full potential. Having said that, the absolute first and most important element of all in book marketing is… the book itself. There is no replacement for a good book. Quality products repay our marketing investment because once other people learn about and interact with the product, they are much more likely to buy it and recommend it to others. This last point is the ultimate goal of our marketing efforts. You cannot force people to buy your book, no matter how much you spend on advertising or how many times you appear in television shows. A friend who tells you that you just “have to read it” is far more powerful than any other influence for most people. Keep in mind that you also need to avoid building defects into your book, because a book that’s poorly edited, hard to read or awkward to handle is going to have significant obstacles finding a wide readership. For this reason, make sure your book conforms to generally accepted editing and design standards so you don’t cripple your own marketing efforts. Okay, let’s say you’ve done your research and put together a book you know people will want. It’s been edited, designed, and you’re ready to go. What’s next? note of. I say to you, I definitely get irked while folks consider worries that they plainly do not realize about. Your comments address many pertinent aspects of promoting a book except one very important issue that I discovered too late when using CreateSpace. Through the Amazon platform, which is excellent, the ability to entice independent bookstore is all but lost. My conversations with such stores gets the same response: without the right of return for unsold books, the stores don’t want to risk buying them. This makes the expanded distribution service offered by CreateSpace just about worthless. Amazon currently refuses to offer such traditional service that most publishers still have as their business model. Using the self-publishing of CreateSpace, which is excellent in all other aspects, the author is forced to abandon the Indy route for all practical purposes. I wish you had a solution for this dilemma . Mike, if you publish with Ingram Spark or Lightning Source, you will be able to mark your books as returnable. You can even do this while keeping CreateSpace for distribution to Amazon, but removing your book from their expanded distribution plan. I have two published books that received good reviews and I dreamed that was all it took. Wrong! The problem is that, though I write very well, I don’t have the physical endurance to pursue the rigorous schedule required to really market a book. (I have MS. Doesn’t keep me from creating, though.) I’m now getting a third book published independently through Create Space and I’d love for this book to reach its intended audience–unhealthy, overweight, busy people who aren’t foodies. Any suggestions that don’t cost an arm and a leg? Members of your target group are likely to be radio listeners as well. Try to book yourself on the shows they listen to as an entertaining author, and you will expand your reach considerably. You can also submit articles to publications that cater to your market because the demographics of their magazine reading is probably easy to find out. Basically, you’re looking for ways to amplify your message. As a new indie author obviously marketing is paramount but my target audience is the senior citizen – my book The Hole Opportunity, is very English humour, appreciated by the older person. I believe that social networking is not high on their agenda and more traditional marketing is appropriate. So I’m looking at doing presentations to book clubs, at libraries and social groups like WI, U3A and Probus but this is all very time consuming. To cover the whole of the UK would be impossible. Any suggestions or ideas? Professionally editing a book is definitely a must for indie authors. A well-written book is more apt to generating positive buzz than a crappy one. Luckily for me, I have two other partners who help in promoting our three books. We tagteam announcements on Facebook, Twitter, Goodreads and other social networks. We also hold contests, do author videos, and target bookclubs. Book marketing is a daily thing, but I’m lovin’ it! As a result, our debut novel has won several awards, including winner of an indie book award. You have to be aggressive in marketing and intereact with your readers daily, I believe. J, if 2 people wrote the book, they should be listed as co-authors. This is very common in book publishing, and some books have three or more authors. My createSpace printed book has been available since July 7th, the Kindle eBook since early August. “The Flying Phone Booth” is the adventures I had producing Candid Camera in it’s halcyon years of the early sixties. It’s serious… discussing my boss Allen Funt’s personality conflicts… funny with stories of many Candid Camera jokes. It is a daily vision of what happens in the life of a director producer and all the people that surround him. Lou, great to have you reading. I never missed Candid Camera back in those days, it was a family favorite, so thanks for that! You might think about setting up a blog and telling your stories there to attract more of the boomers and others who are fans, it may lead to some great opportunities. Best of luck with the book. I wrote a book based on the passion I have for the subject. My marketing so far is YouTube videos, Facebook, Twitter and my website. I gave away 3 books to garner interest as well. I can’t hit marketing as hard as I’d like until October. Also giving a copy to the local library. Vance, good going. Some authors, including me, (and this is for nonfiction) give away a LOT of books, and that can be a great marketing strategy. Good luck! You are right on, and honest, in telling Vance to give away books. Advertising is a basic principle of any business. It is usually budgeted into any enterprise. I keep books with me, even when my wife and I get away for the weekend, which is not as often as we like. I give one to the night clerk at the hotel, but not the bartender unless he asks. They don’t read. Only give one to the bartender who converses in whole sentences, and knows what an infinitive is. I gave one to a lady in a restaurant who was already reading a book. She sold three for me to give to her friends. Either she liked them or was punishing them. I don’t know for sure. Find a venue for standup presentations. (Not comedy, but information.) A little ad in a weekly newspaper of your presentation schedule can help you get in front of a group. I try to do one a month in a different locale each time. Join a local authors club. I am a member of three. Here in Dallas every public library seems to have one. You have to love what you do! I promise you the first time a total stranger recognizes you and wants to shake your hand…you win! What gives me pause is that many bestselling books of the last century didn’t receive a lot of “marketing” effort at all–or they became successful many years later, by accident. Amanda Hocking describes her “quick success”, and the main thing she did was get in touch with book bloggers. As she describes it, her big year of success is as much a mystery to her as to others. She didn’t do a lot of “marketing”. And if your five-item list is comprehensive, you’ve found the philosopher’s stone of the publishing industry, and you can retire. I’m with those that believe it’s a much more haphazard, winding, unpredictable road. Even Konrath says that most of book success is “luck”, and the best thing you can do is have lots of “content” (Egad, I hate that word) for people to peruse when (and if) they find you. Can hard work increase your “luck”? Maybe, but I’ve yet to see that reduced to a formula you can share and repeat successfully with any degree of predictability. And I don’t buy the “quality sells” argument at all for books or other content. Some of the worst content imaginable has the best sales, in books, film, music, and other arenas–often for stretches of many years. Is John Locke selling books on “quality”? I don’t think so. On price? far more likely, and he says as much, I think. A “quality” book is a very subjective thing, though we’d all love to say we know what a “quality” book is. James, it’s a fact that most books (and movies) that succeed do so by the one marketing factor that no one can control—word of mouth, and no quantity of blog posts on the topic is going to change that. Some months ago I featured a self-published book here that was one of the worst examples of book making I’ve ever seen. Really atrocious. It sold 340,000 copies before being bought by Harper Collins. So much for quality. However, successes like that and like Amanda Hocking have nothing to do, in my mind, with the vast majority of self-published authors. Maybe books that are published but not marketed will somehow become a success some day, maybe they will just sink into obscurity. But if you approach publishing as a business, and communicate with the readers who are most likely to enjoy your book, I believe you’ll have more success—however you define it—than if you just leave your book to fate. I think the thing that surprises authors the most is that marketing your book isn’t a one-time event, it’s an ongoing process. I hope the rest of the series fills in some blanks and gives a bit of organization to what is sometimes a chaotic-feeling process. Thanks for all the good advice, Joel. I try to follow most of your tips but haven’t gotten very far with making my novel known. The thing is, I guess, to keep at it. I like how focused the advice is in this article. Word of Mouth seems to be our strongest weapon. It’s free, and it appears to sell most books. And this is where the social media is giving all of us a level playing field. Marketing is the thing I’m struggling with the most at the moment. I really appreciate you writing this post, Joel, and I look forward to reading about viable marketing strategies in this series.